1. 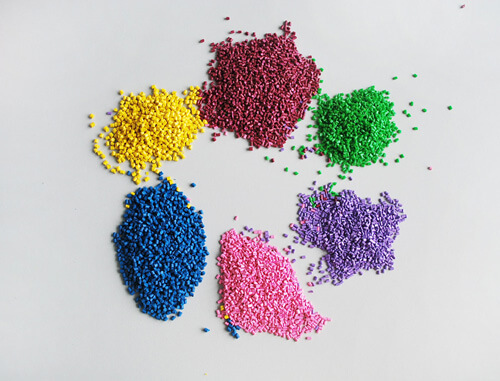 The temperature of the injection molding machine is not well controlled, and the color master cannot be thoroughly mixed with the resin after entering the mixing chamber. 2. The injection molding machine does not add a certain back pressure, and the screw mixing effect is not good. 3. The dispersibility of the color masterbatch is not good or the resin is not plasticized. 1. The temperature of the mixing chamber is slightly increased by the temperature of the drop port. 2. Apply a certain back pressure to the injection molding machine. 3. There is a problem with the matching of the color masterbatch and the resin. This may be due to improper selection of the carrier of the masterbatch, or it may be that the manufacturer randomly changes the resin variety. 4, the machine temperature is not appropriate, the color master stays in the machine for too long. Processing procedure: First check whether the resin type matches the color masterbatch, whether the metering is accurate, and then adjust the machine temperature or speed. If there is still a problem, contact the masterbatch manufacturer. The same color masterbatch, resin and formula, why are the colors of the products injected by different injection molding machines? This is often caused by the injection molding machine. Different injection molding machines have different mechanical conditions due to different manufacturing, use time or maintenance conditions, especially the difference in the degree of adhesion between the heating element and the barrel, so that the dispersion state of the color master in the barrel is also different. A phenomenon will appear. After changing the resin of another brand, the same color masterbatch and formula, the color has changed, why? Different grades of resin will have different density and melt index, so the properties of the resin will be different, and the compatibility with the masterbatch will be different, resulting in color change. Generally speaking, as long as the density and melt index are not different. Large, then the difference in color will not be too large, you can correct the color by adjusting the amount of color masterbatch. Does the color transfer of the color masterbatch during storage affect the quality of the product? Some color masterbats have a high pigment content (or dye), and in this case, migration is normal. Especially the color masterbatch with dye added, serious migration will occur. However, this does not affect the quality of the product, because after the color masterbatch is injected into the product, the pigment is in a normal color development concentration in the product. Why are some injection products not good? 2. The mold finish of the injection molding machine is not good. 4. Excessive titanium dioxide contained in the masterbatch 5. Dispersion of the masterbatch is not good for a period of time, some plastic products will fade. The quality of the basic pigment used by the manufacturer is not good, and drift occurs.